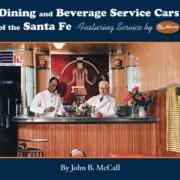 The Santa Fe and Grain Story tells the history of the Santa Fe’s role in the transportation of grains and grain products over the last century. 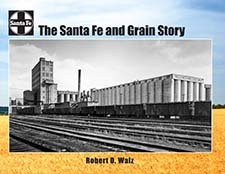 Wheat was the most important grain to the railroad, which had extensive lines throughout the Midwest, including the major wheat-producing states of Kansas, Oklahoma, and Texas. 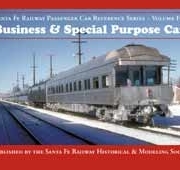 Eastern Kansas, Missouri and Illinois added corn-growing territory to the story, and eastern Texas featured rice. Other important grains were barley, oats and grain sorghums, all of which are discussed to some extent. 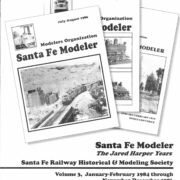 This book is the first in a series to be produced by the Santa Fe Railway Historical & Modeling Society discussing the Santa Fe’s involvement with important commodities shipped on its lines. 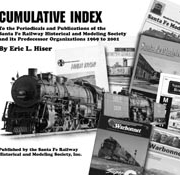 203 pages, 11×8½ perfect bound, 216 black and white and 81 color photos, appendix.